We have more than the regular amount of interest in the in-your-face bigotry and incitement-to-extreme-violence of the loathsome Tamimi clan of Nabi Saleh. We have explained why over and again in past posts. With the background in mind, think now about the stream of news articles during the past six weeks that have delivered up softball versions of Tamimi analysis, driven by yet another in a long series of reports of what are in reality self-engineered "clashes" with the IDF. The central player is, invariably and as always, Ahed Tamimi. Today she's a young woman of seventeen (born January 31, 2001) who, as we sit here writing these lines, is being held behind bars in an Israeli prison while a phalanx of publicists, reporters, TV presenters and politically-active non-governmental organizations calls with rising urgency for her unconditional release. We leave to readers to figure out for themselves why she was arrested and whether and on what terms she ought to be let loose. 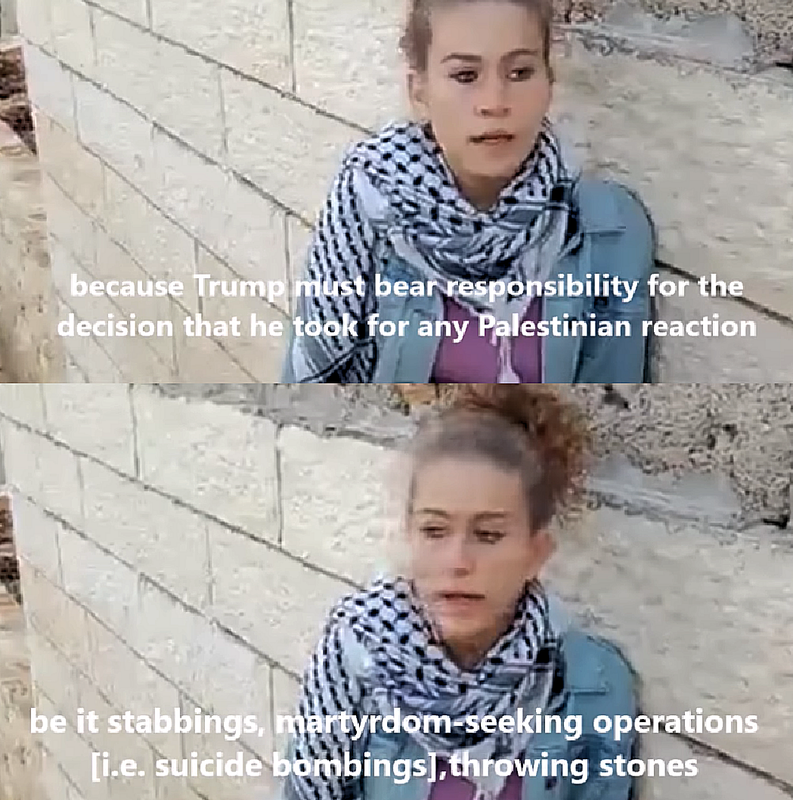 Our comments are prompted by an egregious case, the latest in a depressing series, of superficial and thus second-rate reporting, this time from a serious source: "Meet 17-year-old Ahed Tamimi, the new face of Palestinian resistance" [Derek Stoffel, Middle East Correspondent for CBC, the Canadian national broadcaster, February 4, 2018]. It's simply too painful to quote from. The link is there for anyone patient enough to read the same re-hash of Tamimi PR hand-outs. 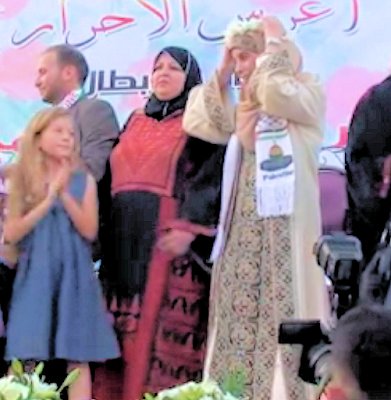 The connection between Ahed Tamimi and her idol, Ahlam Tamimi with whom she is related closely and in multiple ways and at whose 2015 wedding (to Ahed's cousin) little Ahed danced and gazed worshipfully at the bride for the cameras. 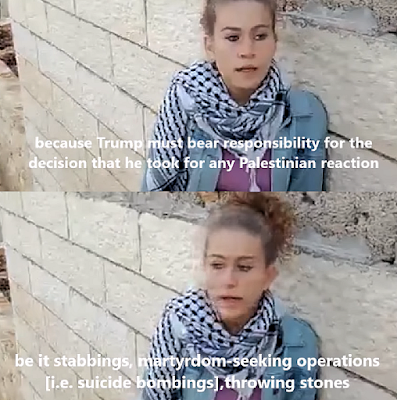 The terrorism-rich personal credo that the adorable Ahed recently recorded for her mother's video camera and which no reporter should ever dare to ignore in telling news-consumers the things worth knowing about this not-exactly-new "new face of Palestinian resistance". 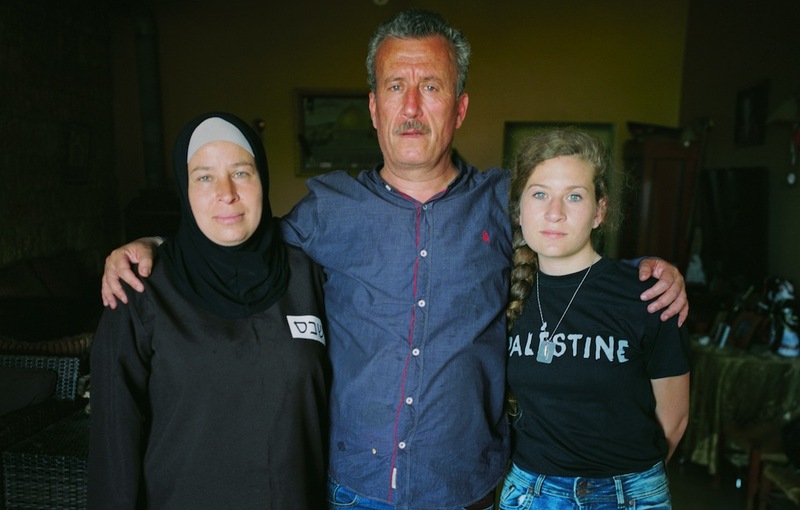 The historian and analyst Petra Marquardt-Bigman has followed the violent Tamimi clan for some years and does an unparalleled job of providing a context to the often-context-free promoting that passes for journalism in much of the news industry. As reported by media around the world, Ahed Tamimi, a Palestinian teenager, has been charged by Israeli authorities with assault, after she was filmed by her family kicking, punching and slapping Israeli soldiers in mid-December. 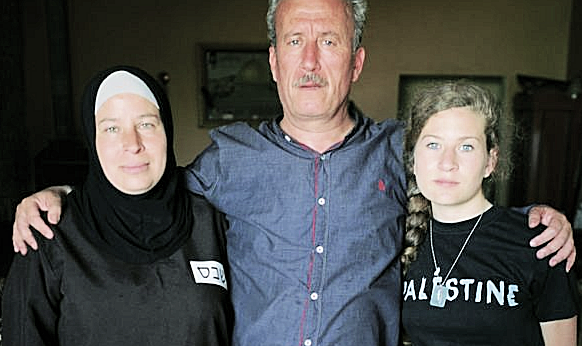 Nariman Tamimi, Ahed’s mother, live-streamed the incident and its aftermath on her Facebook page. About seven minutes into the video, when the soldiers Ahed had attacked – supported by her mother and a cousin – had left, Ahed was asked by her mother to send a “message to the world.” As you can see in this subtitled clip, Ahed seemed embarrassed for a moment, but then she responded by dutifully repeating the slogans she had grown up with. The entire video "message" in Arabic with English subtitles is here on YouTube. There's another aspect to the journalistic wrong done by the Canadian: the absence of background. How did we get here? What caused this innocent child to develop her ideas, her attitudes, her fists? The reality is that Ahed Tamimi has been groomed, trained, weaponized, hardened and massively exposed for years - and by the same manipulative pair of people the whole way: Mummy and Daddy. This is all a matter of the public record that remains just as public when reporters who ought to know better choose to ignore the record. So Mr Stoffel, and the CBC people who oversee your work-product, please thumb through what we published here: "24-Dec-17: Nabi Saleh, the media and a Tamimi child's journey" And the excellent piece by Shoshana Keats Jaskoll that Forward published a month ago: "Why Is No One Talking About Ahed Tamimi’s Call For Stabbings?" Articles like these and like the post you are browsing now are unlikely to get you to see things more clearly or very differently. But ignoring them turns your article into a shallow piece of cheap, amoral flim-flammery.